Create a bee friendly garden in just 5 easy steps. It was not a surprise but definitely a disappointment to read that bees have been added to the endangered species list for the 1st time. This recent designation is for 7 species of yellow-faced bees native to Hawaii, their populations dwindling from scores of individual populations to just over a dozen. Their numbers continue to decline as their habitats become increasingly hemmed in by development. Backing up, just think what it means for an insect-like this to be native to Hawaii. To reach their home, they had to travel thousands of miles over the ocean with enough survivors to begin new populations that would eventually become new species. This is amazing – what a tenacious bunch! Federal protection will determine funding for recovery programs as well as limit further harm from “outside forces”. But we all know this is just a start and, at its core, there is a many-layered problem to be solved. Colony Collapse Disorder and concerns over honeybees and other native bees facing possible extinction remind us the problem doesn’t end or begin with Hawaii’s native bees. Needs are the same for all living creatures, so the answer starts here, with a look at food, water, air, shelter, and each other. What’s less talked about is the need for homeostasis. In scientific terms, homeostasis defines our need for a “relatively stable state of equilibrium”. (Think how you feel when you have a fever – certainly not a state of equilibrium.) Bees are no different. Take away habitat, decrease or limit available food and contaminate environments with chemicals and we have a recipe for disaster. What I love is that we can each make a difference and it starts with our gardens. No matter if it’s a collection of containers, a handful of raised beds, or foundation plantings, what you grow and how you grow it makes a difference. Build in a few bee homes and watering stations and you’re on your way to a bee friendly garden. First, choose a range of plants that flower through the seasons. If you’re limited on space, consider flowering herbs like thyme, oregano, and basil. They offer something for you and for bees. If you have a little more room to work with, include companion plantings that act as bee magnets. Flowering plants such as lavender, calendula, asters, sage, and sunflowers are a good place to start. Seed wildflowers and make room for a few weeds, dandelions are often some of the first to flower in spring. Plant the same or similar varieties of plants in groups so bees can create a reliable foraging circuit. They will soon find their food sources and come back for more. Build homes for bees and other insects and make room in your garden for bees to devise their own homes. Different types of bees build different types of homes. Social bees, like honeybees, live in hives or colonies while solitary bees often tunnel homes in soil, wood and other organic matter. Social bees need cavities for their homes, such as hollow spaces that naturally form in trees and other, similar spaces that are protected. You can make a honeybee home by mimicking their homes found in nature. I’ve seen Michael Thiele, renowned bee whisper, do just that. 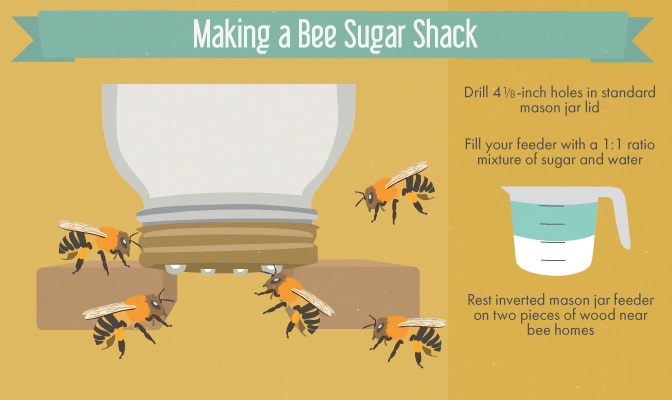 Fix.com does a wonderful job depicting a few sample ideas for DIY bee homes, watering stations, and supplemental sugar shacks. (See below.) The DIY homes shown here are perfect for solitary bees such as Mason Bees. You may want to consider adding an early spring food source for bees, especially if flowers are late to bloom. Issues such as climate change and drought could change flowering patterns of what have always been reliable food sources. A sugar shack could be the solution to a limited food source, though I generally like to think of it as a temporary fix, not a long term solution. The real power is in flowers. Have you ever seen a bee settle in for a drink of water? 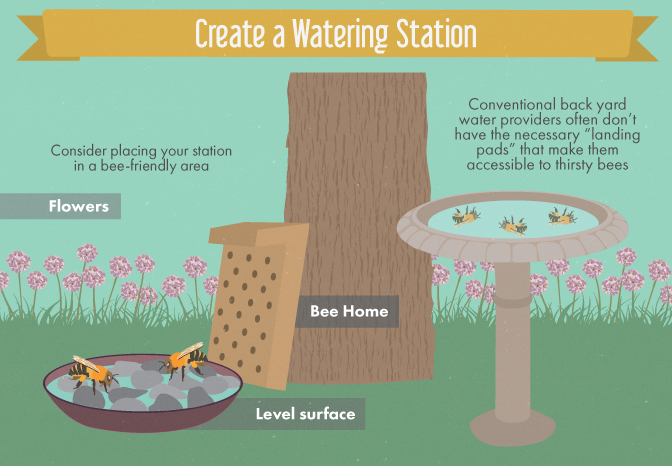 Creating a watering station for bees also attracts butterflies and birds. If designed with a bit of care it can be just as beautiful as it is functional. Garden without chemicals. Chemicals make us all sick, bees included. They’re designed to kill things, not help them thrive. Homeostasis is not possible in the presence of pesticides and herbicides. What’s wonderful is, if you use these bee-friendly gardening suggestions, you won’t need chemicals. Fostering habitats is good for you and for bees. Plant polycultures – a variety of crops not just one type. Make room for bees and other insects. 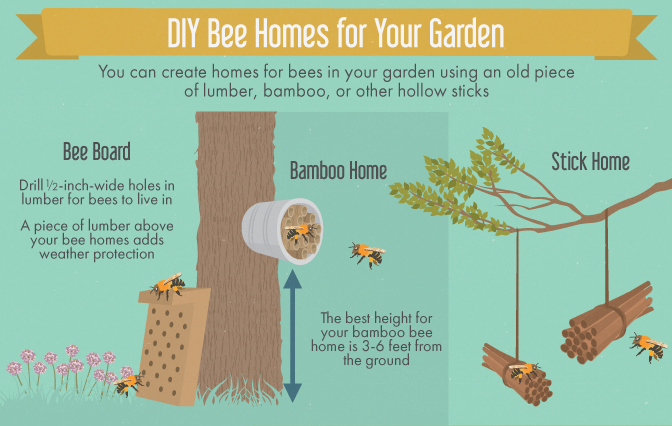 Build DIY bee homes, design watering stations and grow your garden without chemicals. Start here and you’re already making a difference. It’s easy and it’s beautiful. How we spend our dollars makes a difference. As controversial as it is for some, organic is the way to go. It’s not just good for you and your family it’s good for the environment. Organic farms grow food without chemicals and they’re more likely to grow a variety of crops, not just one. Diversity decreases the chance for disease and – surprise – increases the likelihood for a balance of insect populations. Thanks, Fix.com, for sharing your infographics!